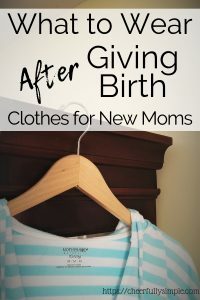 As a parent, I feel like I am ALWAYS looking for new and creative things for my kids to do. You can only play so many board games, build with blocks and read so many books before boredom kicks in. 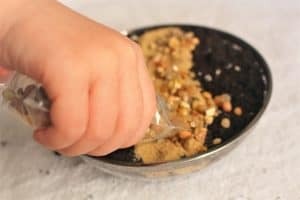 Chances are you have played some fun indoor activities with your kids, maybe you’ve even been successful with teaching your kids how to clean, (hey, a parent can dream, right?) 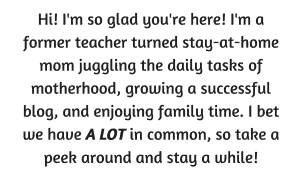 but at the end of the day, you’d love to find something new to do with your kids! *This post may contain affiliate links, which means I receive a small commission, at no extra cost to you, if you make a purchase using this link. I only recommend products I love or would personally use. 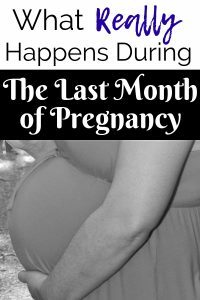 *This is a sponsored post, meaning I was given a product to try and then write a review. Recently I had the chance to try out an awesome, fun and cute activity with our kids! 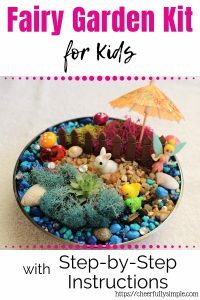 Nicole Pearch @ Party’n with Plants offered me the chance to choose a fairy garden kit, try it out with my kids, and share it with you, my awesome readers! 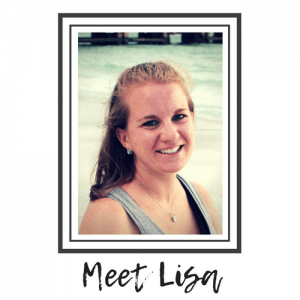 It was SO MUCH fun, and I am super excited to share with you every step of our experience with pictures and words so that you can see just how much fun it was, and how much your kids will LOVE it! But first, I want to share with you what a fairy garden is. 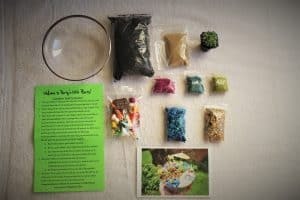 What is a Fairy Garden Kit for Kids? 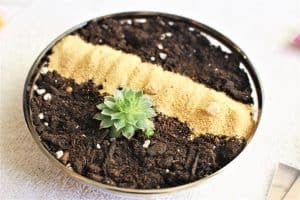 First, fairy gardens aren’t just for kids! Yes, they are usually the first people you think of when you see cute little decorations in a little garden, but adults can totally do them too! You can use this awesome craft as a team building activity, or even as a therapeutic device to destress. Fairy Gardens are little gardens, in this case, about 5ish inches in diameter. You can put whatever decorations in your want, and choose your plant. 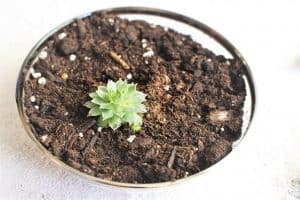 Most fairy gardens often use succulents because they are easy to care for. You can choose to make it by yourself at your house, or together with a group of friends, which can be a lot of fun! 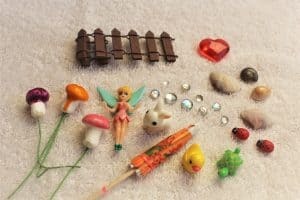 The kits are inexpensive, usually around $15 and come with everything you need to make your fairy garden. I seriously don’t know who was more excited to get this box in the mail- me or my kids! Ha! But seriously, I was super excited to know that this little box was going to give my kids an activity that was fun, and a plant that could help to teach them long-term responsibility. Thankfully, the plant is the box is a succulent, and they are a REALLY hearty plant. You only have to water them twice a month! This is what the box looks like! It was wrapped with a pretty purple ribbon, and I almost didn’t want to open it. It kind of felt like Christmas morning- well, except I knew what was inside. But still, super cute! The infamous question- what comes in the box? I’m glad you asked! 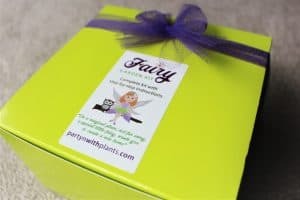 Inside the box, you will find everything you need to make your fairy garden. 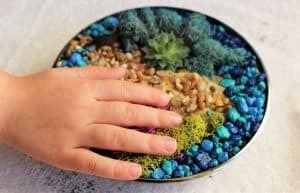 There is a cute plastic bowl, potting soil, sand, two colors of rocks, 3 colors of moss, decorations, the succulent plant, sample pictures of other fairy gardens, as well as step by step instructions. 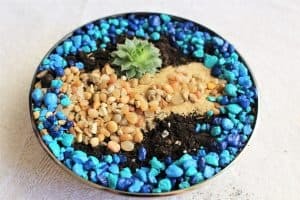 Step 1: Plant the succulent. Step 2: Pour the sand. 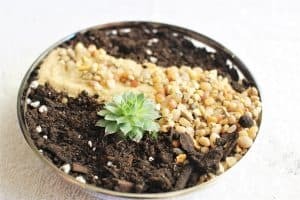 The next step to create your fairy garden is to choose where to put the sandy path! I let my kids choose where to put each of the items, and “kind of” helped when needed. Otherwise, they did everything on their own. Step 3: Pour the rocks. The fairy garden kit comes with two different colors of rocks. Ours came with tan and blue. There are PLENTY of rocks to decorate with! In fact, we didn’t even use all of the rocks. After the tan rocks, we decided we wanted to have some blue rocks around the bowl! Step 4: Place the moss. The next step to create your fairy garden is to add in the moss. There are 3 different colors of moss, and again there is PLENTY! Moss is important because it helps to keep the soil covered, which will help it retain water longer for the succulent. Step 5: Decorations and miniatures included in the kit! This was the super fun part! There are so many cute decorations and miniatures to use to make your fairy garden come alive. I assisted here because there are some pretty small parts. If your kiddo is 3 or under, you’d want to closely monitor this part because the jewels especially are really small. Our kit came with a fence, mushrooms, a fairy, some animals, jewels, shells, and a pretty little heart. Step 6: The Finished Product! Here is our finished fairy garden! I think fairy gardens are a super great craft because no two will ever be alike. It’s a great activity for kids to display their individuality and create something that is theirs. This was my first experience making a fairy garden. Having the fairy garden kit that came with everything in it was SUPER convenient because I would’ve had NO CLUE where to begin. While working on this, I was thinking about some events where this activity would be unique! The first would be a gift for something like a birthday or Christmas! I feel like kids always seem to have SO MANY toys, and so I love gifts that provide an experience. Some designs they have currently are the one we did, which is the Fairy Garden Kit. They also have a Unicorn Garden Kit and a Mermaid Garden Kit. Another thing this would be great for would be a birthday party. And, you may be thinking, “Yeah, a girls birthday party”. BUT, they have other “gardens” you can create. Right now, they have a Dinosaur Garden Kit, a Safari Garden Kit, and they even had a REALLY cool garden kit for Halloween. Right now, their specialty garden kit is a Christmas Garden Kit! 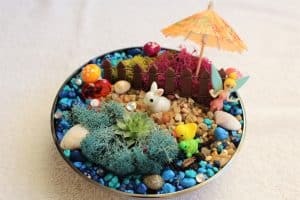 If you’re looking for something for adults, they have an Ocean Zen Garden Kit, which looks like fun! And, if you’re looking to do a birthday party or a party with your friends, you can buy party kits, which will help to save you some money, and have EVERYTHING done for you! I think one of the most daunting things about birthday parties is the prep sometimes. But this is all done for you and each kid gets to take it home! No party favor planning required! There are so many AWESOME things you can do with the fairy garden kits! 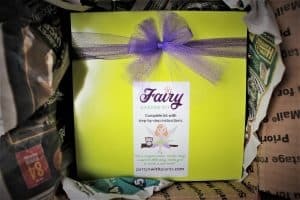 You MUST hop on over and check the fairy garden kits out yourself!